There's no better place to experience the majesty of Louis XIV's France than the Chateau de Versailles. 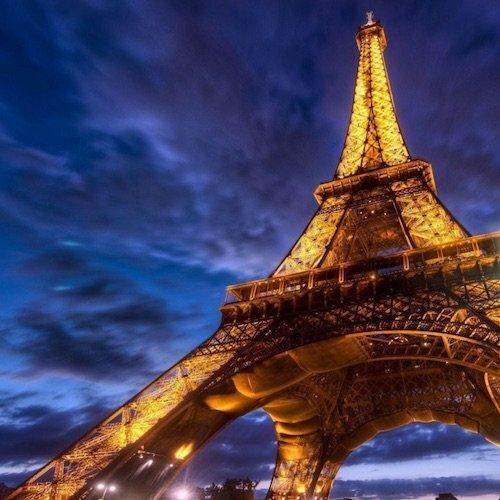 From the decadent Grand Apartments and the dazzling Hall of Mirrors to the opulent Royal Quarters and the formal French gardens, it's a must-see attraction in Paris and immensely popular. We don't like to stand in lines, and we hate waiting for hours, so that's why we always book a skip-the-line tour that includes the services of an expert guide who makes the past come alive with stories of palace life. There are a number of very good skip-the-lines ways to visit Versailles — here are our top recommendations. Instead of worrying about trains, brochures and guide books, choose to visit Versailles this easy and relaxing way. Your driver meets you your Paris hotel for a quick trip directly to the palace, where you arrive refreshed and ready to explore. First up, a morning tour of the Chateau de Versailles itself. 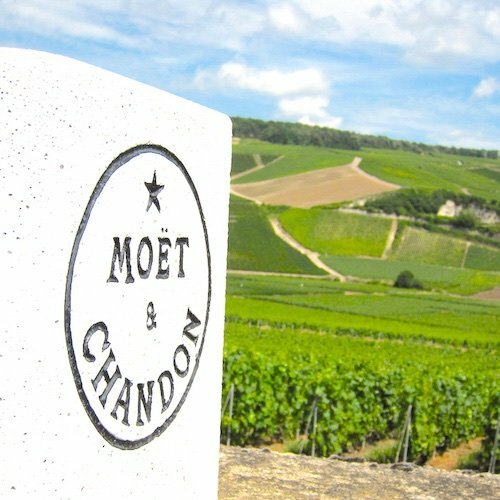 Later, after a classic French lunch near the Grand Canal, your guide leads you to the magnificent gardens and the Queen's Hamlet, Marie Antoinette's private rustic farm. You also visit the Petit Trianon, the mini-palace where Louis XV and Louis XVI liked to relax and escape hectic court life. 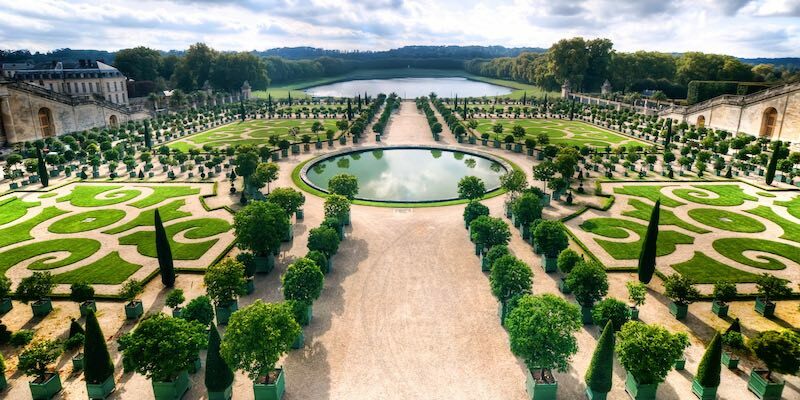 There's free time on this Chateau de Versailles tour to wander through the gardens, surrounded by statues, fountains and marble vases. This full-day tour is very popular, so be sure to book early. 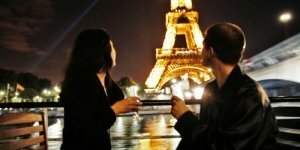 The morning begins when your driver meets you at your Paris hotel or apartment for a small-group (maximum eight people), priority-access visit to Versailles. 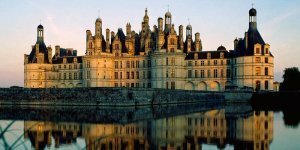 A professional guide introduces you to the best rooms in the chateaux, including Hall of Mirrors and the Royal Apartments. Although this is a shorter visit than the full-day tour (above), there is still plenty of time for you to explore the amazing gardens. Also available as a private tour, for just you and your group. This tour was fantastic! The driver/guide was very knowledgeable about the art and history of Versailles. The small group made it very personalized, the guide was able to answer questions and give extra details based on our questions and interests. It couldn't have been easier, we were picked up and dropped off at the door to the apartment where we were staying." 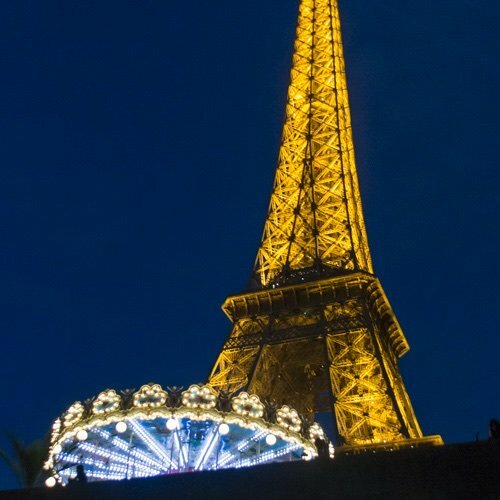 We love this full day of art & history that kicks off with your driver meeting you at your Paris hotel. 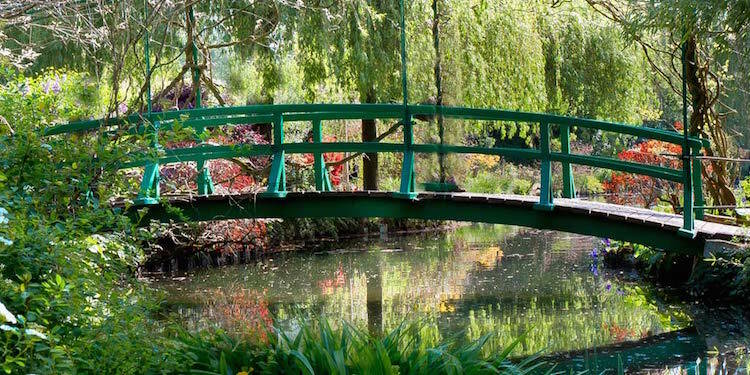 Next stop, Giverny, the home of Claude Monet's famous gardens, his house, and his studio. It's an amazing feeling being in the place when Monet painted some of his most-famous Impressionist masterpieces. 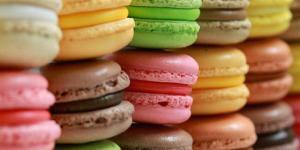 Before your afternoon at Versailles, you stop for classic French lunch (included). Next up — visit the magnificent chateau with your guide leading you to the the Hall of Mirrors, the royal apartment, and other rooms in the royal palace. It was a perfect trip with a great tour guide! The day was well paced with Versailles in the morning and Giverny in the afternoon. My tour group was a lot of fun. 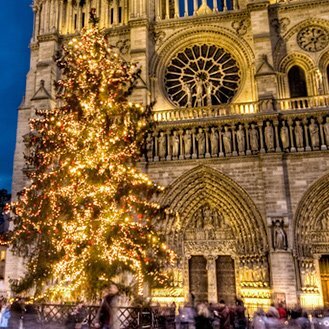 I would recommend this trip to anyone interested in these two sites. The hotel pick up was also ideal and went smoothly." 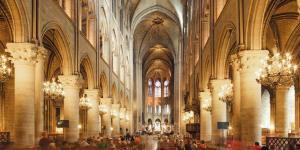 This tour is immensely popular with visitors… and with Paris Insiders Guide readers. 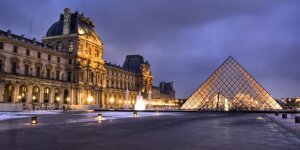 It starts in Paris, where you meet up with your expert guide and catch the RER urban train to Versailles. There you pick up your bike. First stop — the bustling city market to buy ingredients for lunch. 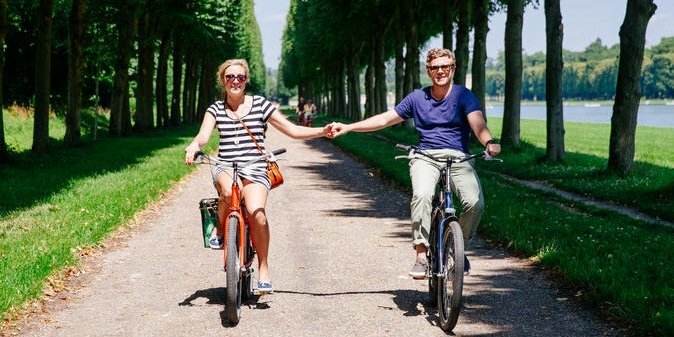 Then you ride through the gardens of the Chateau de Versailles, along tree-lined trails, past fountains, through the forest, leaving walkers behind! The French royal families used to enjoy picnics by the Grand Canal, and that's exactly what you will do. You're not done yet, there's still the palace itself to explore before you return to Paris on the RER. The 9-hour tour includes everything. This activity runs in most months, with a break from December to February. 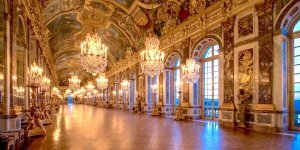 The extraordinary thing about this tour is that it gives you an Insiders view of Versailles that most tourists will never experience. 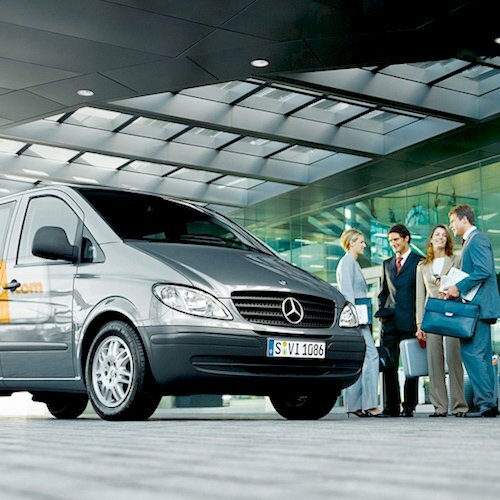 The VIP tour starts with transportation from Paris in a luxurious eurovan. At the royal estate you enter the grounds through a no-lineup priority gate and the palace itself through another private access door. This morning tour to get into the palace before the crowds arrive. On the exclusive private tour you visit the restricted living areas of the French kings and queens — Louis XVI's apartments, his personal library, the Royal Opera House (photo above) and Royal Chapel built for the wedding of Louis and Marie Antoinette. There's plenty of time to explore the gardens (admission ticket included). 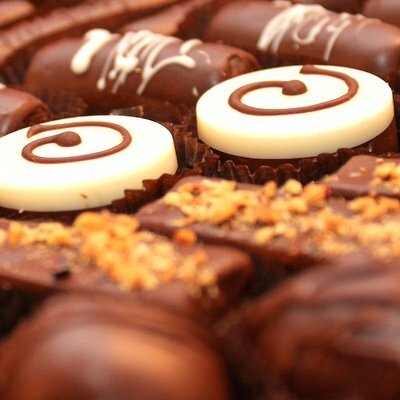 There are a very limited number of spaces on the VIP tours, and they sell out quickly. Be sure to book early. Tours run Tuesday, Saturdays & Sundays. 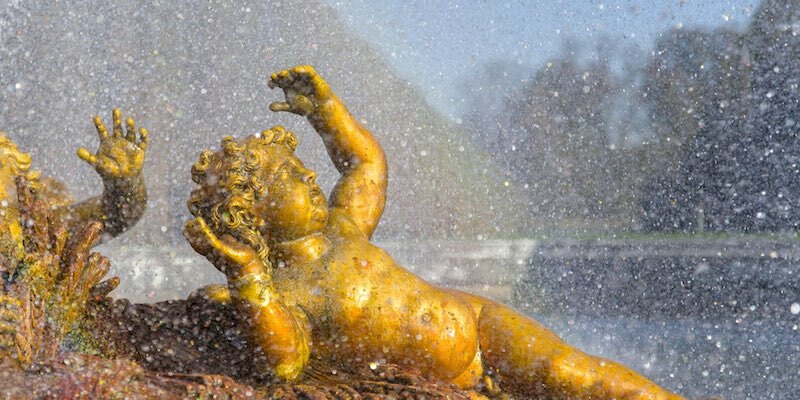 From spring until autumn you have the opportunity to see the stunning fountain displays at Versailles, which demonstrate the artistry and skill of three hundred years of French garden design. This musical event — Jardins Musicaux — features classical music played in the gardens. 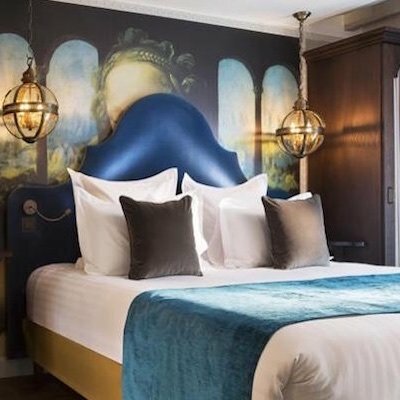 From a central location in Paris, you board a special bus to Versailles where you enjoy a guided visit of the royal apartments and a stroll through the gardens surrounding the palace. 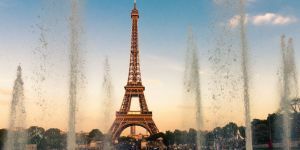 The half-day chateau and garden walking tour with the musical fountain show is available in the warm months on Saturdays & Sundays, from early April to late October, and on Tuesdays in May and June. 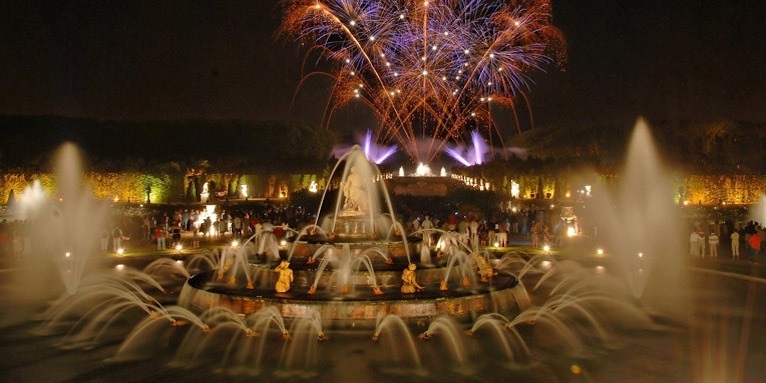 Fireworks, fountains, dances, and operas. 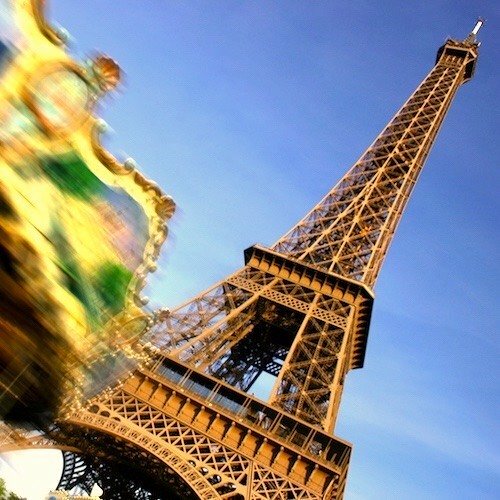 They're called spectacles in French and every year there are many special events planned at Chateau de Versailles, the gardens, and the Royal Opera house. Some events (in the garden, for instance) are during the summer, but many other take place at all times of the year. Water has been an important design feature of the royal estate since the very beginning. In its heyday, there were 2,400 fountains operating in the garden and park. 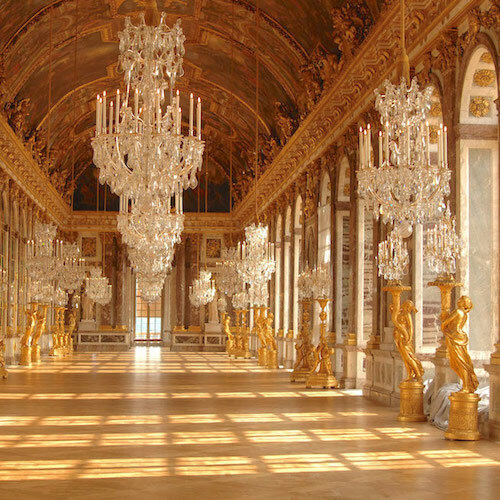 Today there are only 50, yet they still contribute to the glory of Versailles. We take a look at the most popular fountains as well as other important water features. The Versailles estate covers nearly 2,000 acres and includes the chateau (natch), a collection of formal gardens, and a large woodland park. Learn more about these gardens and the park in our guide. By the way, did you know entrance to the gardens is (usually) free? Before you hop in the Eurovan and head out for the royal estate, it's nice to know a bit about its history. 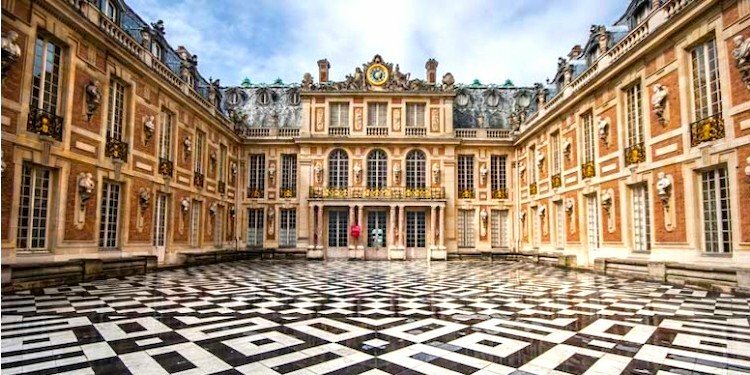 Who built Versailles? Who lived there? We'll also share the five highlights of Versailles that you don't want to miss. It really takes a full day to explore Versailles. 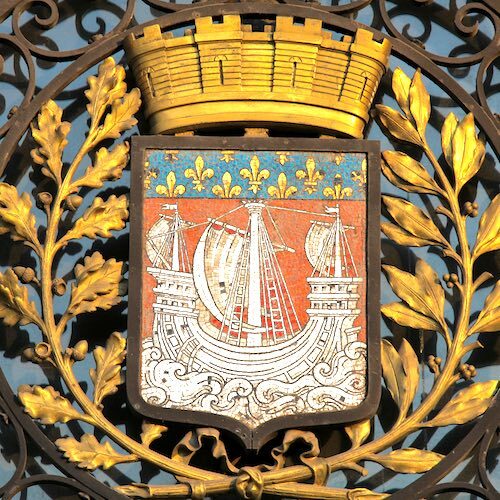 (For instance, is takes an hour to walk from the chateau to the far end of the Grande Canal. Plus there is the Trianon to explore.) So, you're going to need refreshments, bathroom breaks, and rest. Taking time for a meal at on the restaurant on site will take care of all three of those needs. 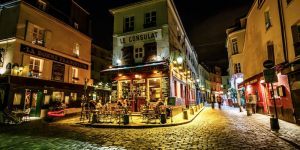 On a recent visit to Versailles we had a chance to explore the options — from a high-end restaurant to tea a salon to casual dining — and we're happy to share our findings with you. From April to October the main chateau is open daily (except Mondays) from 9:00 AM to 6:30 PM. From November to March hours are from 9:00 AM to 5:30 PM. Plan for a minimum 90 minutes for your visit. 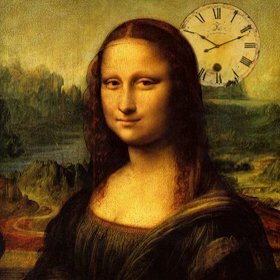 During the summer months, it's recommended to arrive by 9 AM to avoid the crowds. (The crowds are why we recommend skip-the-Line tours and Priority Access activities. These include the Petit Trianon, the Grand Trianon and the Queen's Hamlet. April to October hours are noon to 6:30. November to March hours are noon to 6:30. Always closed on Mondays. It's the perfect place for a walk, renting a boat on the Grand Canal, going for a bike ride. The Park is open free of charge daily from 7 AM to 8:30 PM, April to October. From November to March hours are 8 AM to 6 PM. The gardens are also free of charge except for days when there are a fountains show or Musical Gardens show. The gardens are open daily from 8 AM to 8:30 PM, April to October, and then from 8 AM to 6 PM, November to March. Sometimes the gardens close at 5:30 for special events. Plan for at least 2 hours for your visit.